LONDON KY—On Tuesday, March 7th at 5 a.m. London Police received a call through Dispatch concerning a silver Oldsmobile Alero driving recklessly on Barbourville Road. The caller advised that the vehicle had turned onto KY-192, heading east towards East Laurel Road. Officers Jordan Hopkins and Justin Roby located the vehicle on East Laurel Road as it swerved onto the shoulder of the road as well as had an unilluminated license plate. 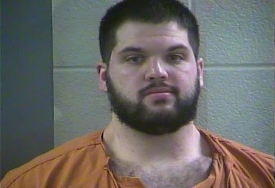 Police attempted to initiate a traffic stop, at which time the driver, David R. Weaver, 26, of Edon, Ohio, accelerated away from them.
. Weaver had crossed into the opposite lane on several occasions and led officers across the Laurel County Line and into Clay County on East Laurel Road. He gave up approximately four miles into Clay County. Following a brief struggle, Weaver was apprehended. He appeared to be under the influence of alcohol and had a strong odor of alcohol with slurred speech. Ofc. Hopkins placed Weaver under arrest and charged him with speeding 16 mph over the limit, rear license not illuminated, reckless driving, operating a motor vehicle under the influence of alcohol/drugs/etc. of the first offense, first-degree fleeing or evading police (motor vehicle), and license to be in possession. He was lodged in the Laurel County Detention Center.